I'm so excited that I finally get to announce that UNHOOKED was the winner of the YAVA award. 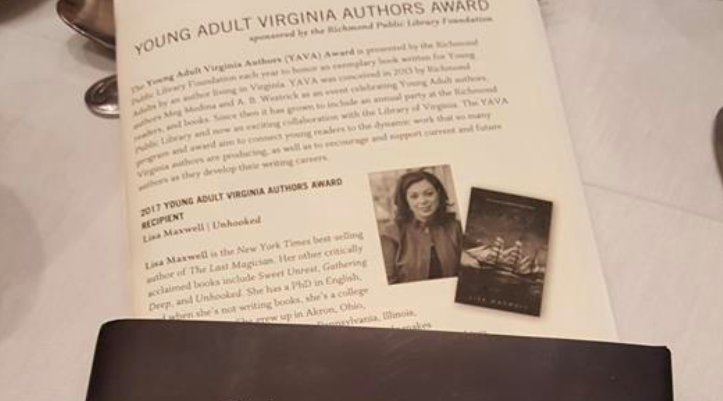 The YAVA is an award from the Richmond Public Library for a YA book written by a Virginia writer each year. Books are nominated and voted on by the public, and then the finalists are read and the winner is chosen by a panel of librarians. It is SUCH an honor to have UNHOOKED be chosen out of a field of books that I so admire. Thanks to everyone who nominated or voted for the book. And thank you to the Richmond Public Library and the Virginia Library Association for the award.